Black, though not traditionally thought of as a Christmas color, is the newest trend in holiday décor. Decorate your tree and deck your halls with all-black ornaments that go beyond classic shapes. 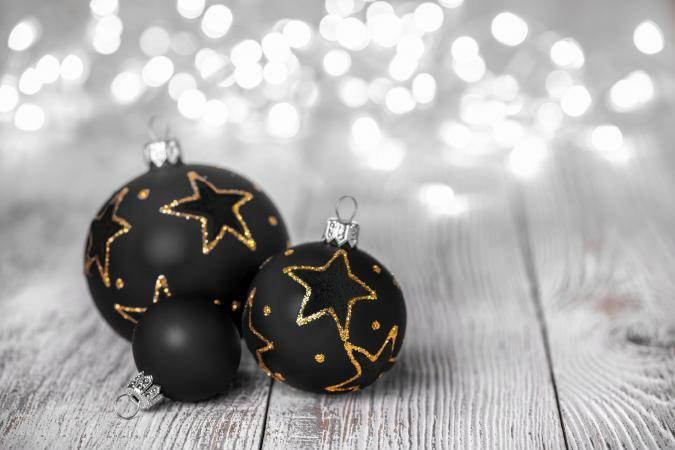 Whether you decorating a white tree or a traditional green one, these black ornaments will look amazing. Select a traditional shape or design for your tree. Chalkboard ornament - This 7-inch metal chalkboard ornament is ready for your personalized message. The price is just over $8. Use these to create personalized ornaments for family and friends or to display the year. Shatterproof drop set - The four black and white ornaments are shatterproof and have a white geometric pattern. The set is under $25. These ornaments would look great on a white flocked Christmas tree, mixed with both black and white ornaments. 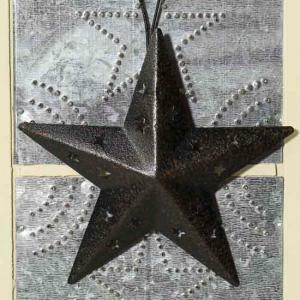 Rustic tin barn star - If you have a rustic décor, this tin barn star will be the perfect addition. The star would be perfect on an all black tree, with a red and black buffalo plaid, or cabin-themed tree. However, it's simple and classic, so would fit into almost any style. Black vintage customizable ceramic ornament - Choose from five different shapes including a heart, square, round circle, and star. The background of the ornament is black with a lace-like quality. Best of all, you can personalize this ornament. The cost is under $25. Black lantern - A 6.25-inch lantern ornament is appropriate for a black stylized decor scheme. The price is around $11. It would look especially good on a rustic vintage style tree. If you have a themed Christmas tree and holiday décor scheme, you'll want ornaments to match. Some might have a hint of color here and there, depending on the item depicted, but they all feature black prominently. Black grand piano - If you have a pianist or want to add a classy touch to your tree, this grand piano ornament to your tree or wreath. The ornament is 3 inches wide and costs around $11. It works perfectly if you have a musical decorating scheme. 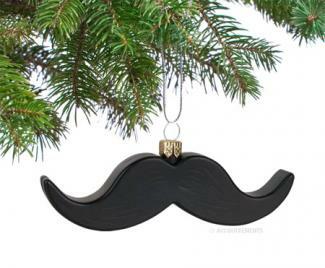 Black mustache - Pop-culture themed trees will be enhanced with this whimsical mustache ornament. For under $9, you can adorn your tree with this trendy icon. Nativity silhouette - This nativity ornament is a perfect way to celebrate the birth of Christ and fits right into a religiously themed tree. At less than $4, you can pick up several. Primitive faux carved crow - Set a Gothic-themed tree apart with a few crows inspired by Edgar Allan Poe's The Raven. It's an affordable option at less than $7. Motorcycle - Toughen up your tree with a black and silver motorcycle. It's perfect for a biker tree or vehicle-themed tree. Steam engine - Trains have a place in Christmas decorations, and can be part of a toy or vehicle-themed tree. Add this black engine to your tree for about $20. Complement your black Christmas tree ornaments with matching wall and tabletop décor. These are options that can make a statement no matter where you place them. 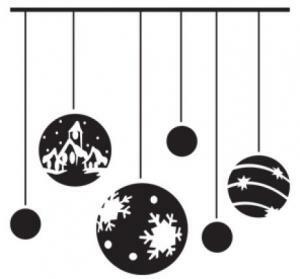 Christmas wall ornament decals - These large (46"H x 43" W) wall decals include six round ornaments. Three larger ornaments feature white patterns (church, snowflakes, and white stripes/stars) and the three smaller ornaments are solid black. The cost is just under $35. Put them behind a couch or in the entryway to make decorating easy. Swirl drop - This 12-inch glitter, swirl drop black and white swirl ornament would be ideal dangling from an ornament holder on a mantle. The cost for this large ornament is about $27. Waterford studs and scroll ball ornament - The beautiful round ornament features a black background with intricate silver swirls. It dangles from a ribbon with the "Waterford" name on it. This item would be ideal for a table centerpiece or displayed with other luxury ornaments on a mantle. The price is $100 and could also make a wonderful gift for someone special. Retro reflector shatterproof ball - This ornament is 8 inches and is around $10. Those cool old reflector balls that dangled on your childhood tree are back, with an updated black look. The ornament is beautiful enough to be highlighted in a display of other retro and vintage ornaments on an end table, rather than used with other ornaments on a tree. Antique black barn star - This 24-inch diameter barn star is the perfect wall ornament for a classic country Christmas. It features a distressed matte black finish and has a pre-drilled hole so you can add a hook, ribbon, or hanger. The item costs just under $30. Vickerman Christmas tree drop ornament - This 13-inch chrome, black, and zebra stripped drop shaped ornament is large enough to stand alone and command an audience. It's the perfect accent piece for a tablescape. At under $9, this piece is affordable and is shatterproof. Black sequin bow ornaments - If you're decorating with black, gold, and white, you can add these glittering ornaments to your home for under $9. While these could be used on a tree, they would also look amazing dangling from a ribbon in front of a window. The sunlight is likely to hit the sequins to create a festive look. Consider creating your own black ornaments. Use free Christmas ornament patterns with black materials to transform them into your own unique design.